Is CBD Legal in Texas? "What is the legal status of CBD? "Cameron Pinkerton, legal assistant at the Law Offices of David Sloane discusses the legality of CBD in Texas, the 2018 Farm Bill, the FDA's recent statements about CBD, and Tarrant County District Attorney Sharen Wilson, who made national headlines regarding comments she made about prosecuting people in her district for CBD products. As the country has become more informed about marijuana, the public’s opinion has shifted with an overwhelming majority of Americans now in support of legalizing cannabis. Texas actually has partially legalized, and allows for medical use of cannabidiol (CBD). Many in the state are confused about the details of legal CBD in Texas and there is a lot of misinformation being spread around. 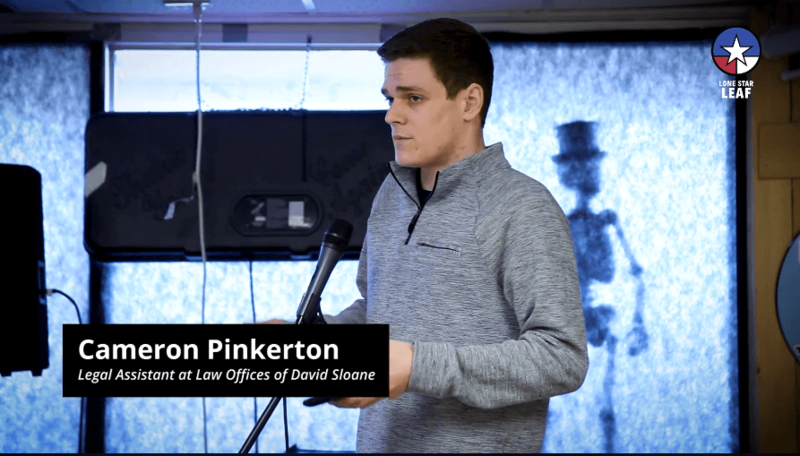 Cameron Pinkerton, of the Law Office of David Sloane, recently appeared at the DFW NORML monthly meeting to clear up the confusion surround CBD in Texas. In the video above posted on Lone Star Leaf , Cameron gives an overview of the legal status of CBD in Texas, the 2018 Farm Bill, and the FDA’s statements regarding CBD. Part of the confusion regarding CBD is that CBD falls into a grey area under Texas law. Under the Texas Controlled Substances Act, the term “Marihuana” does not include resin extracted from Marihuana. Instead, extracts and concentrates derived from Cannabis are prosecuted separately as Penalty Group 2 controlled substances. Specifically, Tetrahydrocannabinol (THC) extracts and resins are prohibited. CBD, however, is not explicitly prohibited, which has led some to believe that it is legal to possess and use. Cameron explains that CBD is actually still illegal except for those who are patients under the Compassionate Use Program who have intractable epilepsy. In his Lone Star Leaf talk, Cameron starts by explaining the FDA’s stance on the substance. Companies that sell CBD extract, market their products as a food supplement to skirt regulation but the FDA has publicly stated that it does not consider CBD a dietary supplement since it is an active ingredient in drug products that have been approved for clinical trials. Epidiolex is a CBD based anti-seizure medication that has been approved by the FDA after undergoing clinical trials in 2018 to treat Lennox-Gastaut syndrome and Dravet syndrome. This means CBD extracts fall outside the definition of a food supplement. According to Cameron, the FDA has stated that they are waiting to see how marijuana and its extracts are regulated before it starts to prosecute those who market and sell CBD but it would be within their authority to prosecute should they choose to. Next, Cameron discusses how the 2018 Farm Bill removed hemp from the federal Controlled Substances Act across the country. This allows federal and state agriculture departments to regulate hemp production. CBD can be derived from hemp and it will be up to agriculture departments to decide whether extracting CBD for sale is an appropriate use of hemp production. Finally Cameron points out that Tarrant County District Attorney, Sharen Wilson, has already stated that she will prosecute those caught with CBD. Wilson based her policy on the Texas Commissioner of Health’s addition of marijuana extract to Schedule 1 of the Controlled Substances Act. This definition includes any extract containing one or more cannabinoids but again excludes resin. If you have been arrested for possessing CBD extract reach out the knowledgeable attorneys and staff of the Law Offices of David Sloane. We are at the forefront of the fight to end cannabis prohibition and can help you understand your charges and help formulate a formidable defense for you.